I don't think I can claim to have ever actually owned a tunic in my life, but I like it. I like it a lot. I actually wore this tunic to my family's Christmas Eve get-together, but as a dress with a slip underneath rather than faux leather leggings like I did here. I love pieces like this that can be so versatile - a dress one day, a shirt the next! I felt the need to toughen it up a bit with these faux leather leggings from Aritzia. I bought them last year and they have proven to be such a great investment. I'm actually quite surprised at how often faux leather leggings are necessary! To finish off the look I, of course, needed to add my very favorite Vince boots and this cross-body bag that seems to go with everything. I actually feel like this would be quite work appropriate if you don't work in a strict corporate environment like I do. I wish I could be wearing this today! What do you think about the tunic? Are you a fan? What a gorgeous tunic hun, you look beautiful! 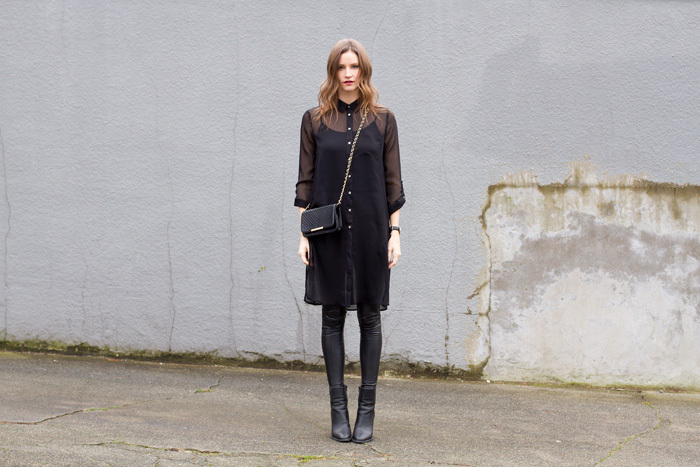 I love black tunics! Wearing a tunic as a light layer makes me feel more covered up, comfortable and feel it as a perfect summer layer. I get super frustrated with workout pants from other retailers cause they tend to show though around my booty. I've checked a few times and these don't show though AT ALL. The workout gear also smooth out my thighs and backside very nicely.